Humanity 101 responds to the question: “Are we losing our humanity?” Project Humanities raised this question in September 2012 in an op-ed piece in local Valley newspapers and in USA Today, in a National Press Club forum, as part of a local community film series, and as part of multiple public lectures to diverse groups across the Valley and beyond. An overwhelming desire to respond to this question with concrete actions continues to emerge. Humanity 101 addresses how "human progress” impacts equality, equity, and social justice in America. Harvard President Drew Gilpin Faust contends that “Humans need meaning, understanding, and perspective as well as jobs.” Humanity 101 is thereby a growing multidisciplinary and multimodal toolbox of specific strategies and programs, hands-on activities, blogged interactions, workshops, symposia, PSAs and endorsements, an eBook, a theme song, Hacks for Humanity hackathons for the social good, checklists and curricular guides, a comprehensive website, and print, visual, and virtual resources that add perspective and meaning to daily experiences. Humanity 101 can be customized for various communities—business, medical, educational, faith-based, social, and scientific. The Toolbox is portable and adaptable for diverse audiences and purposes to consciously, routinely, and deliberately engage each individual and group. The goal of this workshop is to guide participants through critical conversations about "difference' that move beyond typical “diversity training” to explore systems into which we were all born and exist. 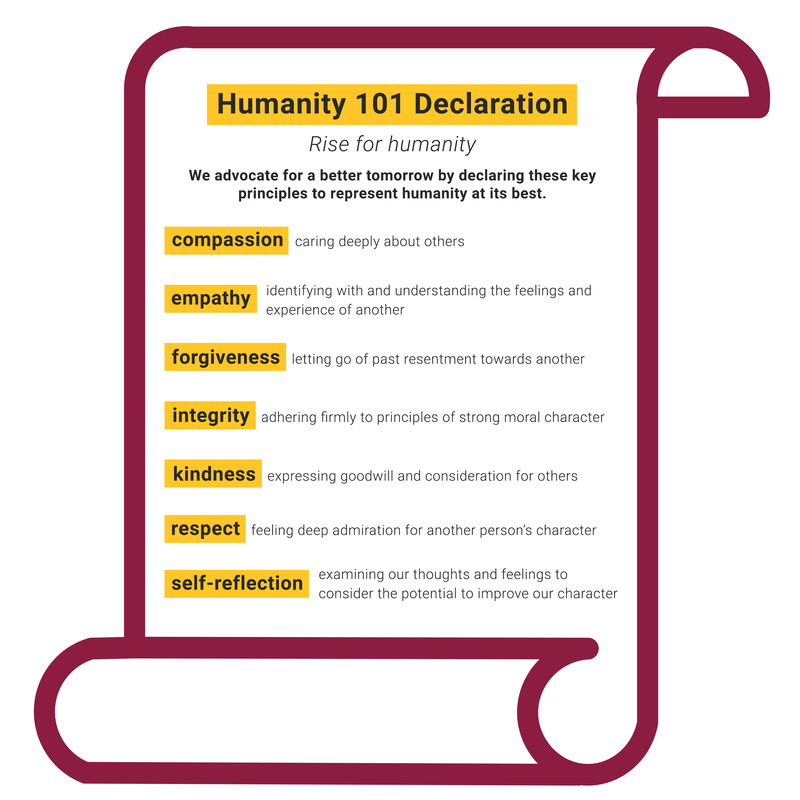 The workshop challenges us to recognize and promote our shared humanity through seven values Arizona State University’s award-winning Project Humanities identifies as Humanity 101—respect, integrity, compassion, kindness, forgiveness, empathy, and self-reflection. The success of the workshop depends on each participant's willingness to challenge their own assumptions about others and to be self-empowered. Once we know and see the world through the eyes of others' lived experiences, we may choose not to acknowledge, but we cannot un-know. Knowing better, to paraphrase poet Maya Angelou, we do better. From 6:30 – 8:30 am, student and community volunteers come together to serve an adult homeless population by distributing gently used clothes, shoes, and other essentials. What started out as a "Spontaneous Day of Service" has now become a bi-monthly (every other Saturday) gathering of committed and enthusiastic volunteers from across the Valley - all ages, backgrounds, and talents.